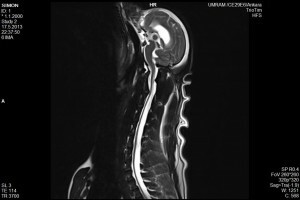 We can describe Chiari-like Malformation as an overcrowded and narrow caudal occipital fossa and cervicomedullar junction due to a congenital developmental malformation of caudal occipital bone. 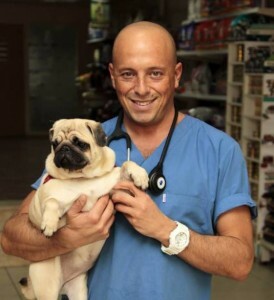 Disease is similar to Chiari Type I disease in humans and therefore named as «chiari like malformation» in dogs. 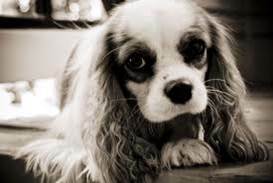 Chiari-like malformation is a hereditary condition and first described in king charles cavalier spaniels and altough several other small breeds can become effected king charles cavaliers are the most common breed effected by the disease. The other reported breeds are; Griffon, Miniature poodle, Yorkshire terrier, Maltese, Chihuahua, Bichon frise, Staffordshire terrier, Pug, Shih Tzu, Dachsund, Pincher, French bulldog, Jack Russel Terrier, Pekingese and Boston terriers. Affected patients has a kind of cerebellar compression and narrowing around foramen magnum and cervicomeduller junction. 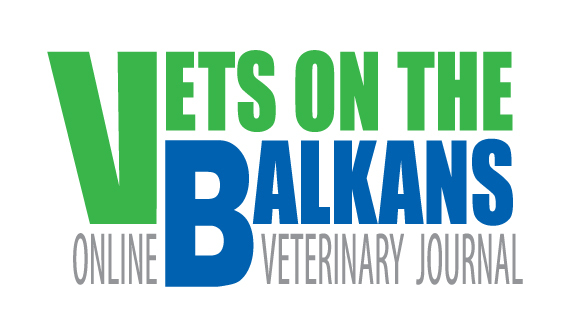 Although in humans almost all chiari malformation patients has some degree of cerebellar herniation , in dogs cerebellar herniation is not that common and this is the main difference between these 2 species. Caudal occipital malformation syndrome is a genetic deformation of the mesoderm of caudal occipital bone causing cerebellar compression and herniation. 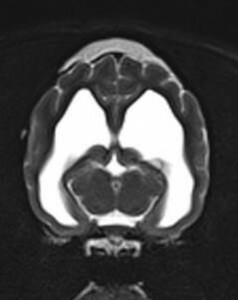 In normal dogs CSF move from cerebral subarachnoid space to cervical spinal subarachnoid space through foramen magnum in every sistom and diastol in a pulsative manner. Compression and partial obstruction caused by Chiari malformation disturb CSF flow in both ways but because of high systolic pressure push CSF to central canal of cervical spinal cord and produce a cavity with this hammer effect. Valsa maneuras like barking and coughing, make sudden changes in intrathorasic and intraabdominal pressure which cause epidural venous distention and fast fluid acumulation to the cavity. 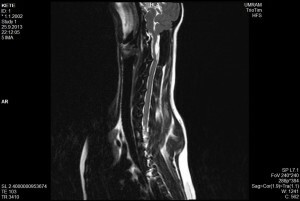 Because of spinal epidural vein distention and compression in cervicomedullar junction syringomyelia cavity continue to enlarge gradually. Herniated cerebellum increase the amount of obstruction , CSF flow and fluid accumulation. 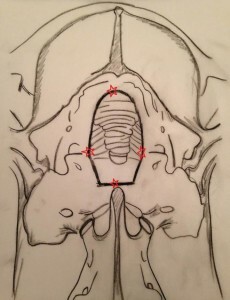 CSF will flow from intrcranial cavities to cervical region easier but can not come back again. Presentetion of the disease is different from patient to the other. The first signs can be seen from 5-6 months to 9-10 years. The disease can cause several different neurological signs. , facial rubbing, air licking, fly catching, tail chasing, vocalization, pain reaction during atlantoxipital palpation., cervical myelopathy, fore leg paresis characterized by lower motor neurons, multifocal CNS dysfunction, torticollis, scoliosis, seizure activity. 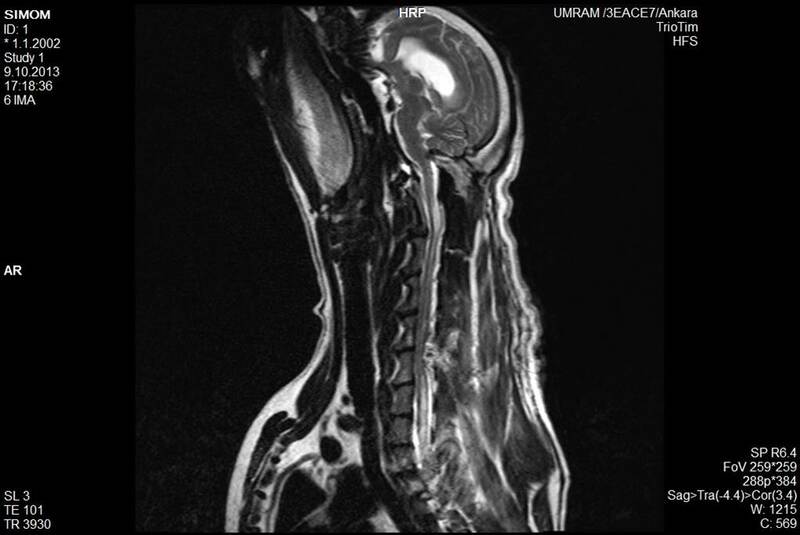 Pain due to or seconder to syringomyelia is a very important symptom and it happens because of the damage on the dorsal horn of spinal cord. 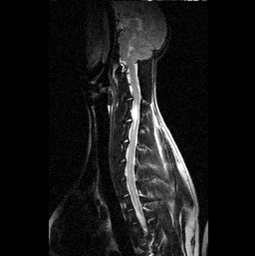 Abnormal sensitivity in head, shoulder, neck, axillar and sternal regions is prominent in several patients with syringomyelia but pain severity is not directly correlated with the amount of the fluid inside the spinal cord. Pain is most common in king charles cavaliers and usually more dominant in one side. Scratching is another very common sign in king charles cavaliers and stress, excitement or a touch to the neck stimulate or increase sctraching. Some dogs has a scratch point and react to a simple touch to this point. The scratching style usually without touching the body is also unique and that is why named as air scratching or phantom scratching. In some severe cases the patients can have cervical myelopathy, cerebellovestibüler dysfunction and multifocal central nervous system dysfunction. In these cases severe neck pain, strabismus, head tremor and nystagmus can be observed. 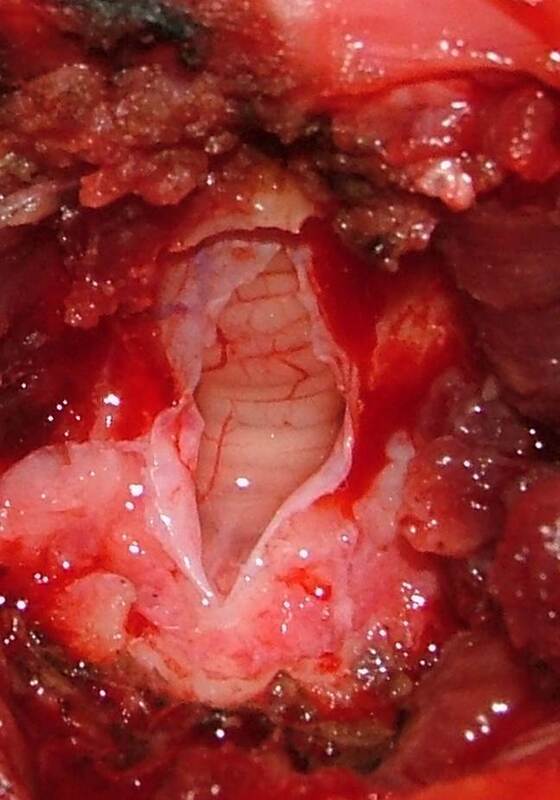 Loss of muscle tone due to asimetric innervation of paraspinal muscles can cause opusthotonus. 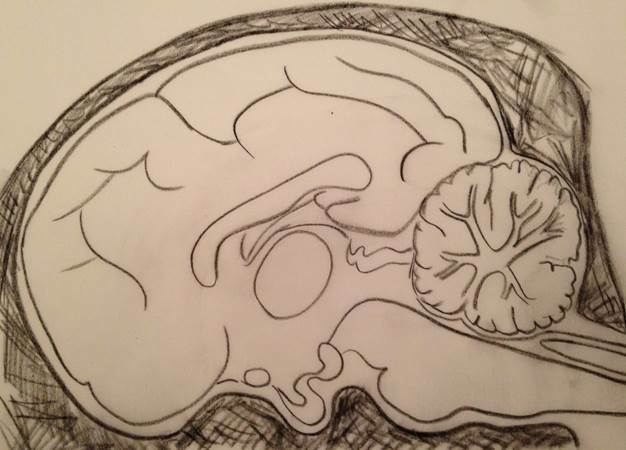 Some patients with chiari-like malformation can have seizures but pathogenesis is not so clear. This rare condition can be related with impaired cerebellar functions because cerebellum has an inhibitoric effect on seizure activity. The most common neurological and physical examination finding is atlanto-occipital pain and increased sensitivity on pin point palpation on atlanto-occipital joint. 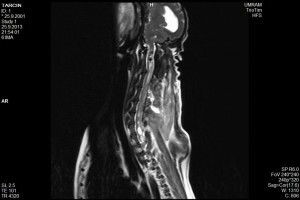 the foramen magnum, caudal occipital fossa and cervical spinal cord will show syringomyelia. 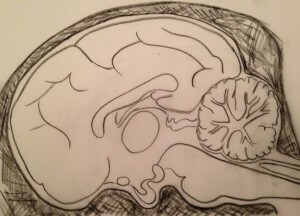 We can describe magnetic resonans imaging findings as a narrow subarachnoid space in cervicomedullar junction, occipital bone compression on caudal cerebellum, rostral movement of caudal cerebellum, syringomyelia, cerebellar herniation from foramen magnum and kinked appearance of caudal medulla. Lateral vetricle dilatation is a very common sign but hydrocephalus is a possible but rare condition. 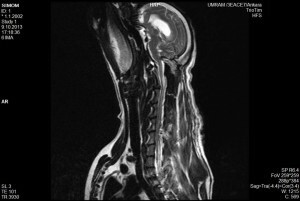 Most of the patients with syringomyelia can spend their whole lives with mild neurological symptoms without any need for medical or surgical treatment. Life quality is the main concern for treatment decision. Patients with obvious neurological signs and pain and non-responsive to pain managment therapies are candidates for surgery. Patients with mild symptoms and pain or non-responsive to pain medication are candidates for medical treatment. Non-steroidal antinflamatoric medications are not effective against neurologic pain. In severe cases pain can be manage just by some anticonvulsants like gabapentin( 10mg/kg tid) or pregabalin (2-4 mg/kg bid). Last researches showed that omeprazol decrease cerebrospinal fluid production and can be used in some patients but some studies done in rats showed that long term use can cause hypergastrinemia and increase the risk of stomach cancer. The other medicatios can be used to depress the clinical signs of syringomyelia are; acetozalamide, furosemide, corticosteroids, and phenobarbital. Another promising medication for neurologic pain is palmitoylethanolamide (pea) nad can be effective in several syringomyelia patients. Surgical treatment is indicated in patients with worsening neurological signs and unresponsive pain. 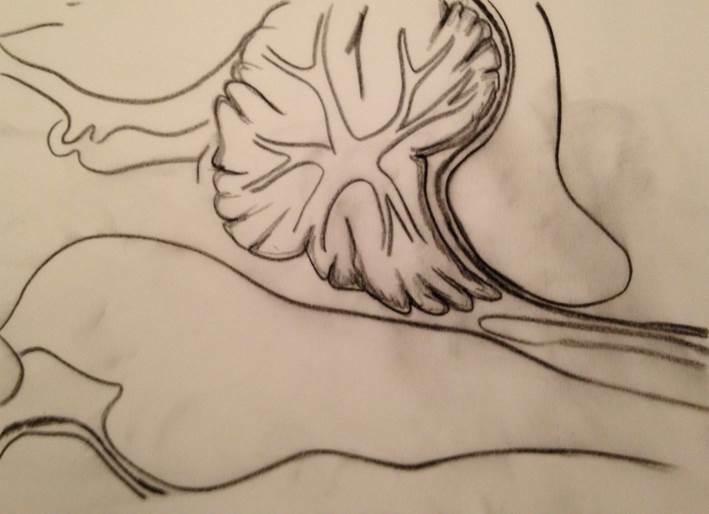 Aim of the surgery is to reorganize cerebrospinal fluid flow pathways and decrease the abnormal CSF in side the central nervous system by decompressing cerebellum. 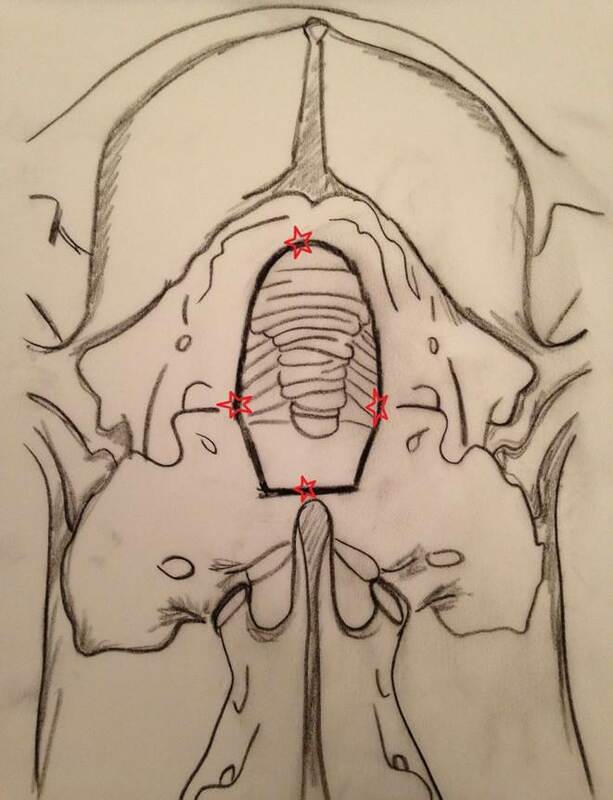 For this aim “Foramen magnum decompression” is indicated by a suboccipital craniectomy and partial dorsal laminectomy of first cervical vertebra that enlarge foramen magnum . Foramen magnum decompression window limits and borders are so important. A small window will be effectless and a large window can cause atlanto-occipital instability or excessive bleeding in a very sensitive area which can cause life treating situations. Lateral borders of the window are atlantooccipital joints and lateral vertebral foramens of atlas , rostral borders are midpoint of the distance between protuberentia occipitalis and dorsal border of foramen magnum, caudal border is ¾ of atlas. 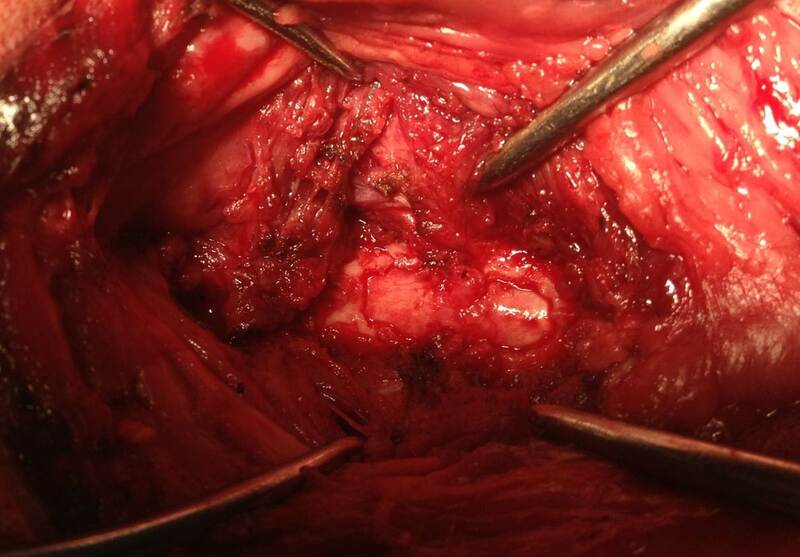 Durotomy and marsupilization of dura to the muscular structures around the foramen magnum window is the common procedure but cerebrospinal fluid leakage can cause an inflamation and this inflamation can lead severe soft tissue thickening which can cause compression in the area. Altough durameter is firmly attached to the bony structures in atlantoaccipital region carefull dissection can be done without duratomy to prevent csf leakage. 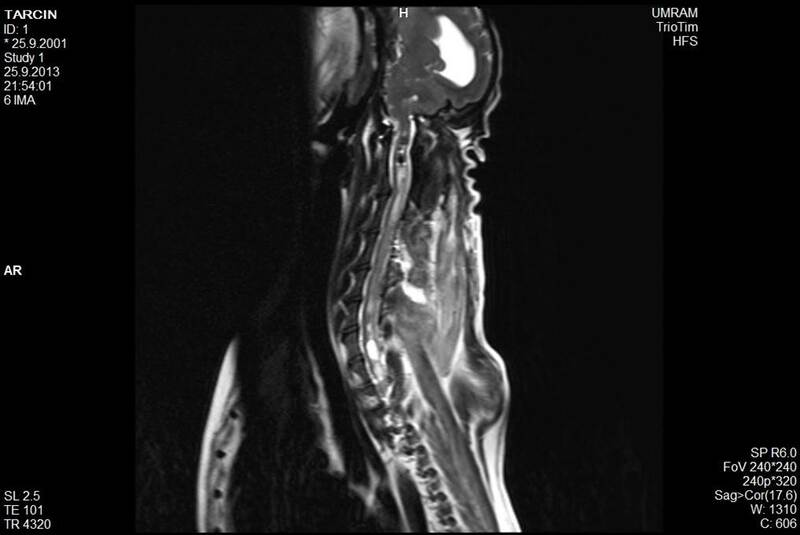 Foramen magnum decompression will reorganize cerebrospinal fluid flow but the present fluid and the syringomyelia cavity will remain which means the present symptoms will continue most of the time. 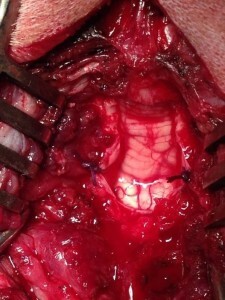 Foramen magnum decompression is most effective against pain which is the most common indication of surgical treatment. To drain the present syrinx in syringomyelia cavity “syringosubarachnoid shunt application” is the most effective and popular method. Approach to spinal cord with a dorsal laminectomy where the syrinx cavity is most prominent has to be done first. 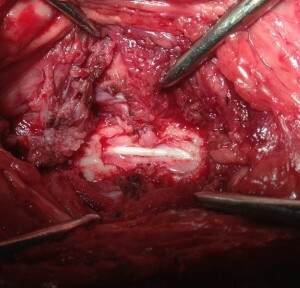 After a “T” shaped duratomy placement of a shunt in 1-1.2mm thickness from syrinx cavity to subarachnoid space has to be performed to complete the procedure. As a result chiari-like malformation and syringomyelia is one of the most important breed predispositions of veterinary medicine and although the disease is reported in several other breeds it creates a very important clinical problem among king charles cavalier population. 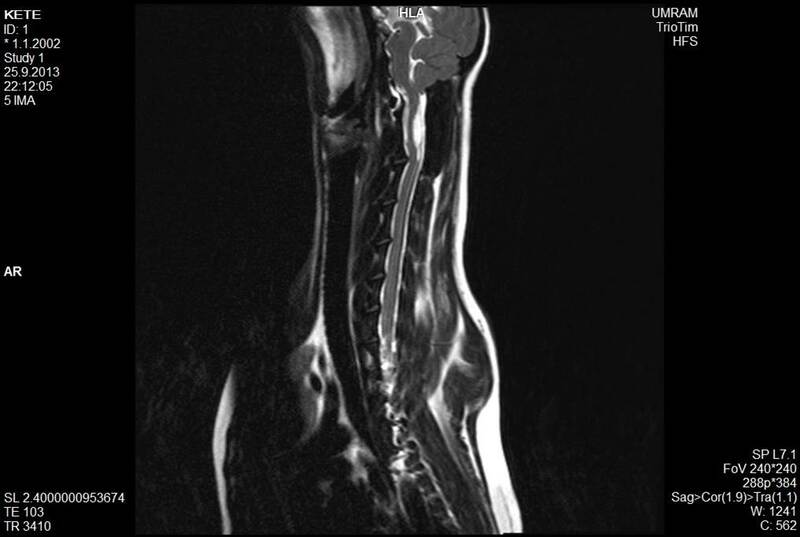 Most of the patients with syringomyelia can live whole their lives with very mild symptoms within a normal life expectancies but some patients will have cervical myelopathy, cerebellovestibüler dysfunction and multifocal central nervous system dysfunction. Pain and life quality is the main concern and criteria for treatment. Patients with obvious neurological signs and pain and non-responsive to pain managment therapies are candidates for surgery. 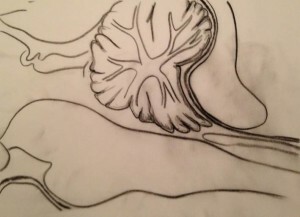 Foramen magnum decompression and syringo-subarachnoid shunt application are the two surgical procedures described to reorganize normal cerebrospinal fluid flow and drain syrinx from its cavity.